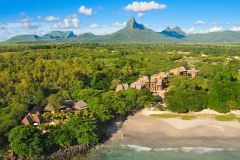 Carved into the rugged savannah land on the south-west coast of Mauritius, between mountain and sea, Tamarina Golf & Spa Boutique Hotel overlooks the clear blue waters of Tamarin Bay and sprawls over 200 beautiful hectares at the foot of towering Rempart Mountain. Tamarina Golf & Spa Boutique Hotel is situated on Mauritius's west coast and is very close to the lovely seaside resort of Fliq & Flaq. This beautiful area is crossed by the striking Black River gorges and Rempart River. Tamarina ‘s fabulous Championship Course weaves its way over the rugged savannah land and is framed with mature trees and crossed by the Rempart River. It was designed by Rodney Wright, who has designed many fine courses in the Far East and Hawaii. The holes have been specially designed to not only provide a great challenge - with a blend of birdie holes and longer par-4s - but to also afford spectacular views of Mount Rempart , the towering mountain range and Tamarin Bay. The course has four par-3s, four par-5s and ten par-4s and can be stretched to 7,400 yards, but there are five sets of tees so it caters to golfers of all levels. The greens are built to USGA specification, with special imported turf laid down on the tees, fairways and greens, providing great conditions all year round. A fantastic 300-metre practice range is also provided, with large putting greens and chipping and bunker facilities. Due to the climate and the nature of the terrain, golfers are encouraged to use golf carts, taking advantage of the four miles of cart paths throughout the course. A refreshment cart is also available as well as a halfway house where golfers can get snacks. It is a child friendly golf club, too, with good teaching packages available for children and a state-of- the-art video analysis available from the professionals. The Tamarina Golf & Spa Boutique Hotel is a striking 50-room, 4-star plus boutique hotel set in beautiful natural surroundings. It offers guests peace and tranquilly while the exciting range of golf and Spa packages enhance the experience of staying here. Rooms are styled with a fusion of African and Mauritian features, with private balconies or spacious terraces adding another welcome dimension to the living space. Contemporary luxuries also make these rooms a great place to relax and unwind. You'll find air conditioning, twin or king-sized beds, LCD flat screen televisions with satellite channels, DVD players, minibars, internet connections and i-pod docking stations all at hand to help ensure your stay is as enjoyable as possible. The clubhouse restaurant, le Dix-Neuf, is open seven days a week and serves great breakfasts and lunches every day. Light snacks are also available until early evening. Then there's La Madrague Restaurant and La Plage, which offers spectacular views over Tamarin Bay, famous for surfing and dolphins. La Madrague is well-known for its fresh seafood menu which is served every day. Local attractions nearby include the Casela Nature Park. It extends over an area of 14 hectares and hosts more than 150 different species of birds as well as many other animals like the Mauritian Macaque, tigers, lemurs, local deer, wild boars, ostriches and giant tortoises.